Hidden City: The Chapel in the fields. One of the most intriguing things about any landscape urban or rural isn’t so much what you can see as what you can’t, and how what is there covers up what was, or how it gives up clues. The Assembly House in Norwich covers a particularly interesting one. The Assembly House site sits in an area of Norwich which until the 13th century would have still been largely crofts and fields, just on the edge of the Norman settlement in what became the French quarter. The city wall, which runs along the edge of Chapelfield and around the city, was yet to be built. Beneath the site and in the fabric of the house, parts of the early buildings still lie mostly hidden. 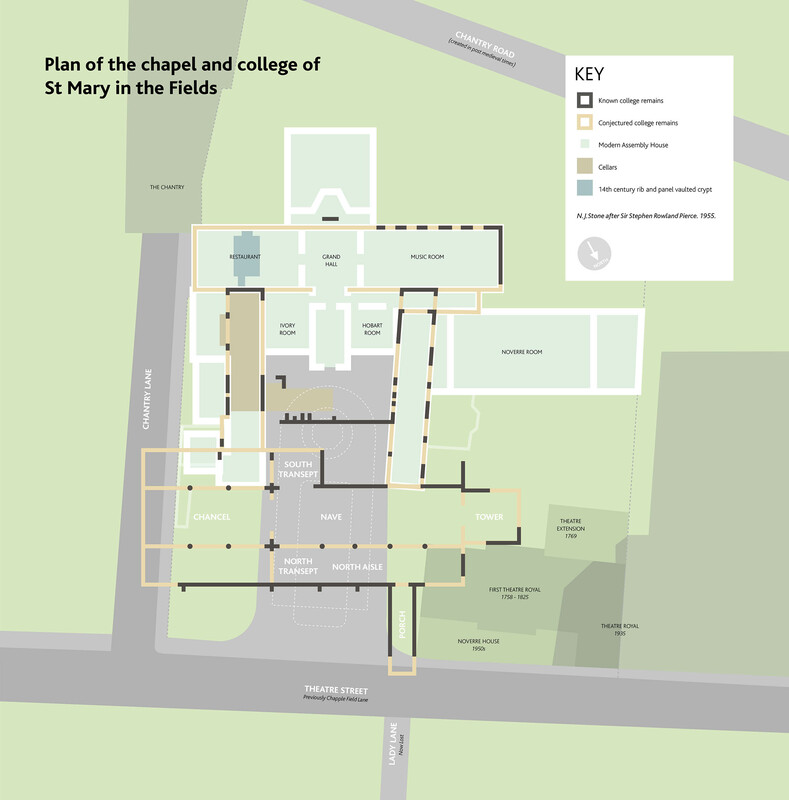 They form the remains of the medieval chapel and college of St Mary in the Fields (St Mary de Campo). In 1248 the land was granted to John Le Brun. He founded the hospital of the Blessed Virgin Mary on the site of the Assembly House with the assistance of his brothers, who gave the advowson or legal right to their churches: St Mary Unbrent, St George Tombland and St Andrew. In 1278 Le Brun became the Dean of what had by then had become a secular college, and was in charge of the community within; a Chancellor and a Treasurer, a Precentor to lead the singing, Prebendaries who effectively administered it and drew a stipend from its endowments, plus lay-clerks who formed the choir. The Chapel of St Mary in the Field was an important entity. It grew during a period of tension between the people of the growing city and the power of the cathedral. The dedication to Mary and the foundation of the Guild of Corpus Christi may relate to Le Brun’s conjectured involvement in the riots in Tombland against the cathedral and his attempt to curry favour with Rome. As an entity the chapel and college provided a bridge between the cathedral, the people and the city. 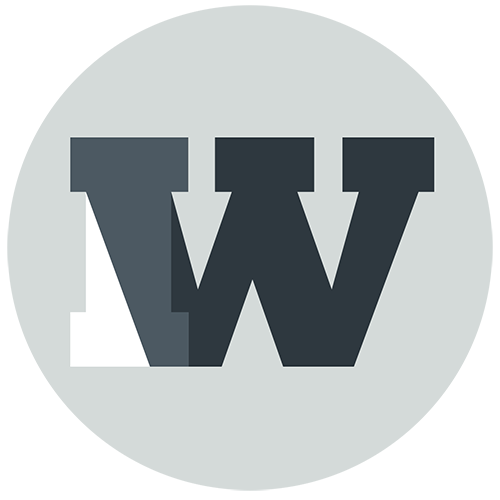 As a result it received civic funds, bequests and support from the city. In 1388 the college acquired the advowson to St Peter Mancroft, then in a particularly poor state. The college also held several other churches in Norfolk, bringing the total, including the chapel in the fields, to nine. The college chancel was rebuilt between 1425 and 1435, with other areas restored from 1444; and a rood loft built in 1501. Before the Guildhall was built the college had come to be used as a meeting place for the city corporation, the tradition of civic assemblies running deep in the site. The college ceased at the dissolution of the monasteries in 1544 under the last Dean, Miles Spencer, and was surrendered to Henry VIII. Two years later the site was granted back to Spencer, by then the Archdeacon of Norwich. He fulfilled his legal obligation and the chapel was demolished. The remaining buildings were also slowly pulled down and sold while part of the college was turned into his residence. 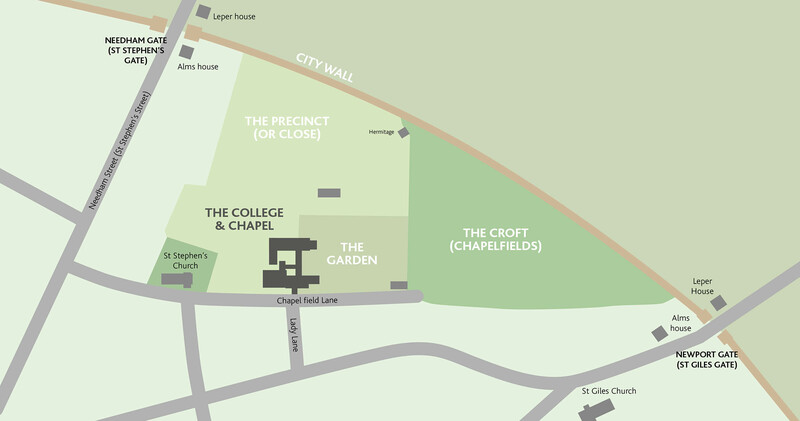 The area around the lost college and chapel is echoed in the street names: Chapelfield Gardens was part of the precinct and close which originally stretched back to the city wall, and Chapply Fields (now Chapelfield) stretched almost as far as St Giles’ Gate. Other street names still bear the area’s history. Chantry Lane and Chantry Road both remember an aspect of its religious life too. Lady or Lady’s Lane, now under the Forum, may have been titled as such as a processional way to the Church, opening as it did directly opposite the original porch. Elements of the building live on; some of the fabric still exists in the current Assembly House: the footprint of the Music Room, Grand Hall and Ballroom match the original Great Hall and Parlour and some material exists in that building fabric, including a Tudor window frame bricked into a wall. Both wings also follow lines of medieval walls. 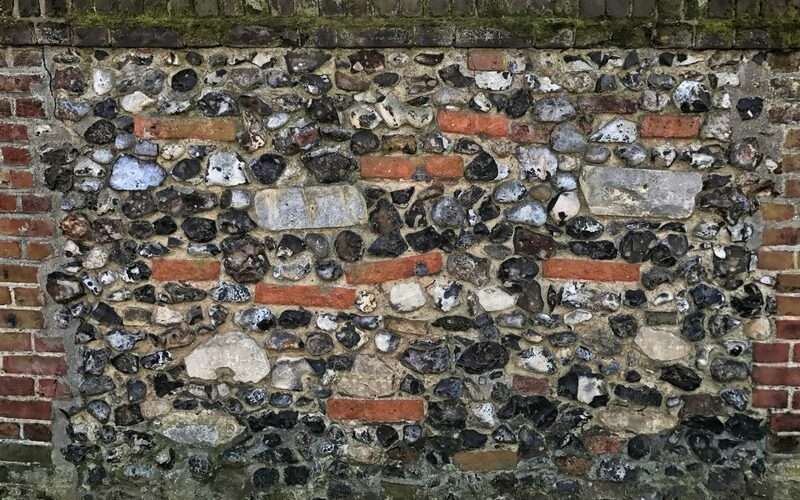 If you look at the wall to the right outside the gate you will see pieces of ashlar dressing and what appears to be the profile of a window mullion in the mixture of brick and flint. 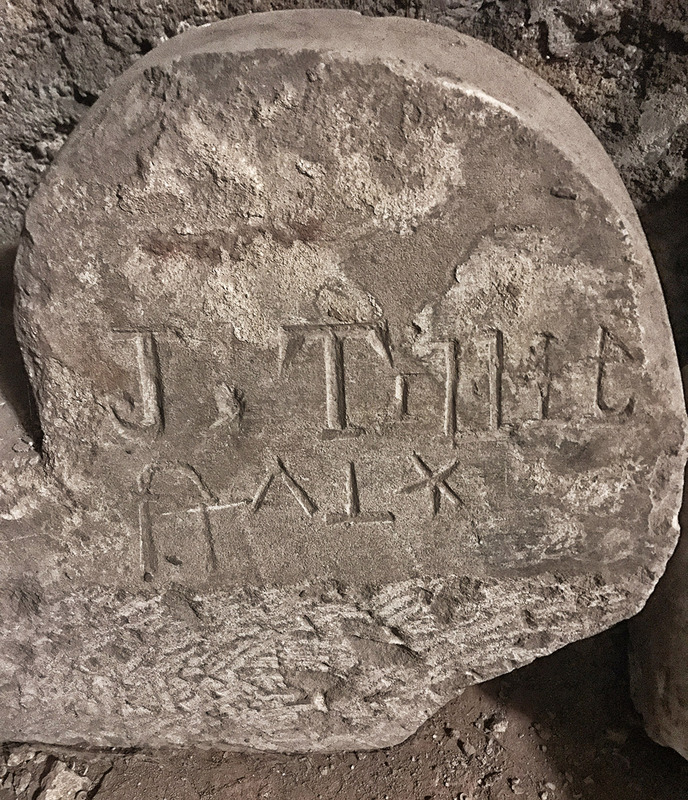 It is probable that these are demolition rubble or waste from the chapel. As you can see from the plan, as you walk through the gates and cross to the steps you are walking across the original aisles and nave of the church, past the tower of the chapel now buried under the gallery and theatre next door. Once inside you are standing in the cloisters. The bells still survive in the church of St Lawrence. 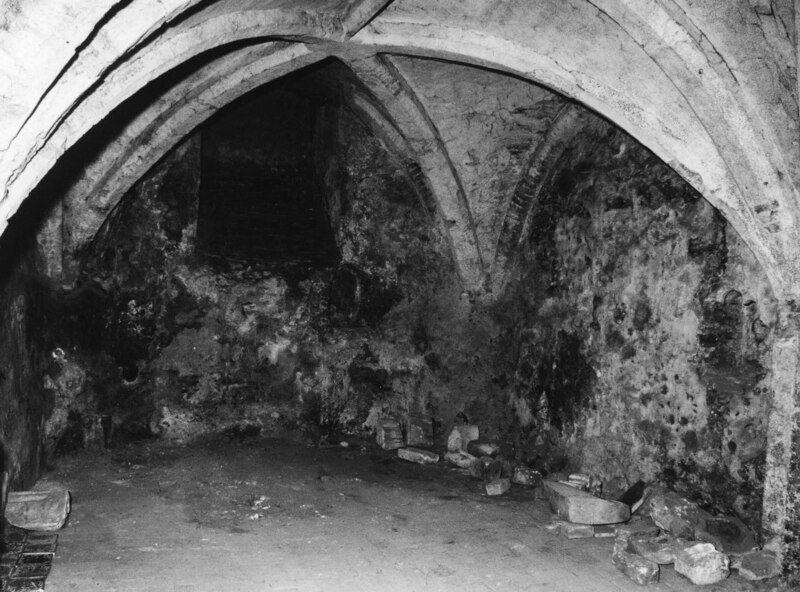 Part of the crypt still exists under the Restaurant with an impressive vaulted ceiling and an area of floor which appears to be the original tiles dating to somewhere around the foundation of the college. You will find a stone plaque in the corridor to the right of the reception. 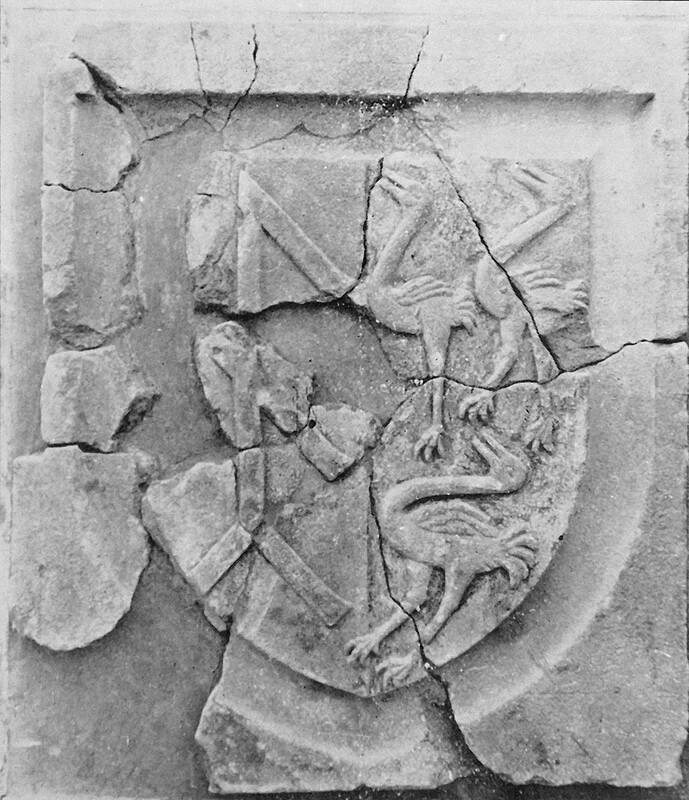 Excavated in 1901 from the north aisle of the church, it is thought to be the merchant’s mark of the Browne family of Norwich. Browne rebuilt the nave of the church of St Stephen’s in 1550. This was almost certainly completed using material from the college and chapel. The Brownes are believed to be descended from the original Norman le Brun family.